While acting as the leading cellular company in Pakistan, Mobilink has done a fantastic job for its customers by providing every possible communication opportunity with lowest possible rates. But still it is considered to be an expensive cellular network if you compare it with other competitors like Zong or Ufone. They are making desperate efforts to fetch customers and make them a permanent user. But Mobilink is smart enough to survive in the national competition and that is why it instantly introduces a competitive package whenever any offer is launched by other cellular companies. The day packages refer to the call rate packages that you are offered during the day in which you can make as many calls as you want and your account will be deducted as per hour basis. This package is named as Jazz Ghanta Offer and thousands of calls are made each day on this package, which ensures that there is proper response of Mobilink customers and company’s efforts are not going in vain. Check out the complete details of this package and talk at all time lowest rates. Mobilink has always strives for the best services to its customers and this Ghanta Offer is another exclusive deal. This offer can only be activated on Jazz Easy Package. Now Mobilink family can enjoy sharing valuable moments with each other. Don’t hesitate to tell your friends that what are you doing, where are you going, what are the plans of recreation and all other secrets of your life. This offer is one of the most economical offers of all times. As the name indicates, it will be charged as per hourly basis and account is deducted with specified amount right at the time you have made a call. Just hang on to read details of subscription and costs of this package. This offer is available only for Jazz Easy Package subscribers. 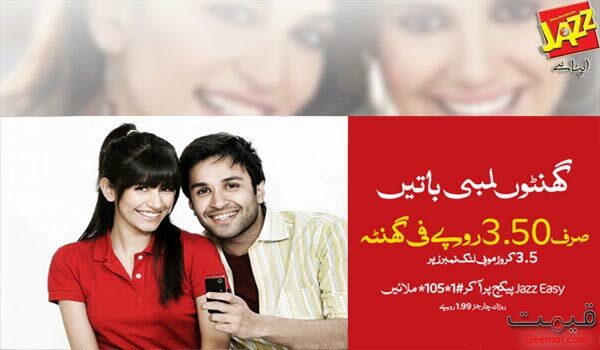 You can make unlimited calls to all Mobilink numbers for 24 hours. Charges for making calls are Rs. 3.50 plus taxes per hour. These charges will be charged as per pattern of Rs. 0.90+tax per first three pulses and Rs.0.53+tax for the fourth pulse. After this, the call will become free for a whole hour. One pulse means 30 seconds. Jazz Easy package holders can avail this offer by dialing *105*1#. This is a limited time offer by Jazz and Jazz Easy Old package subscribers cannot avail this offer.